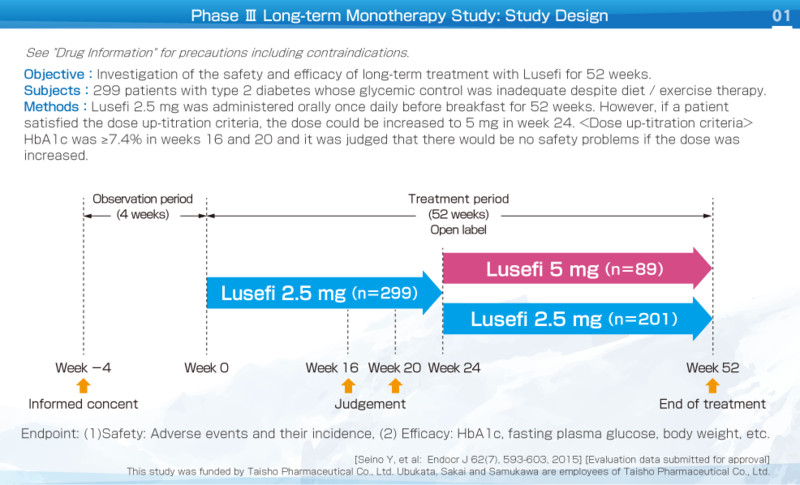 This was an open label study (long-term study) that investigated the safety and efficacy of long-term treatment with Lusefi in patients with type 2 diabetes whose glycemic control was inadequate despite diet / exercise therapy. 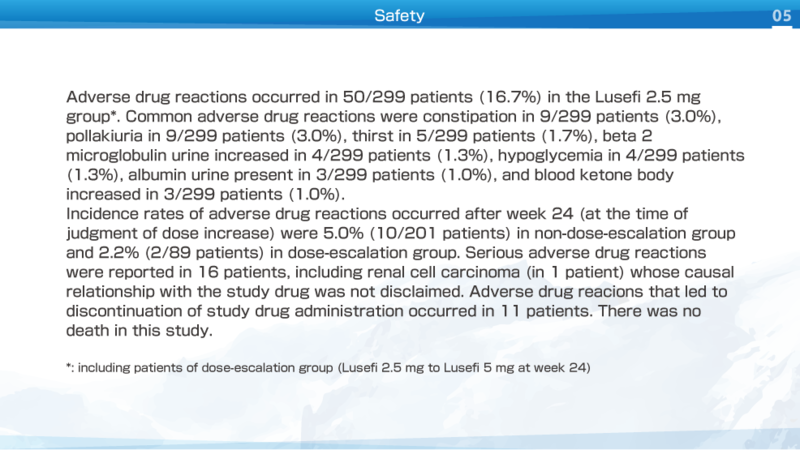 Lusefi 2.5 mg was administered orally once daily before breakfast for 52 weeks. 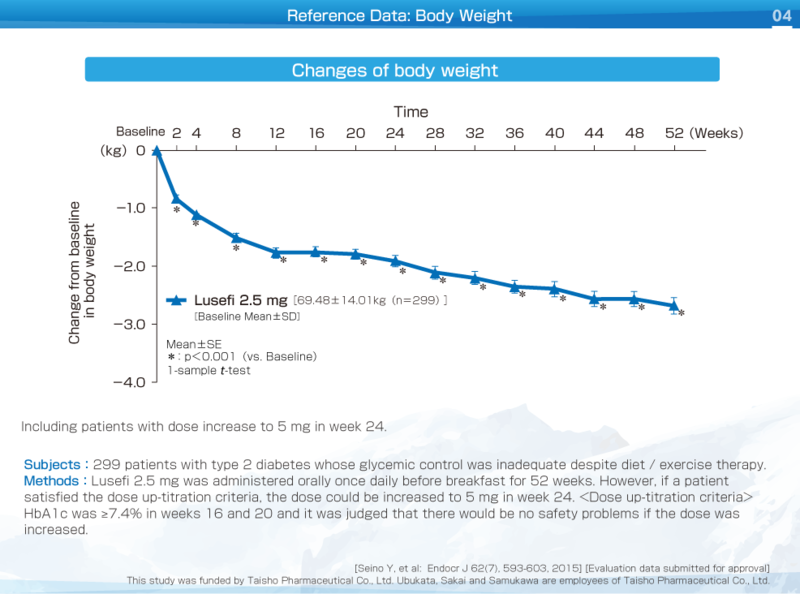 In patients whose HbA1c was ≥7.4% in weeks 16 and 20, the dose could be increased to 5 mg in week 24 if safety was considered to be acceptable. 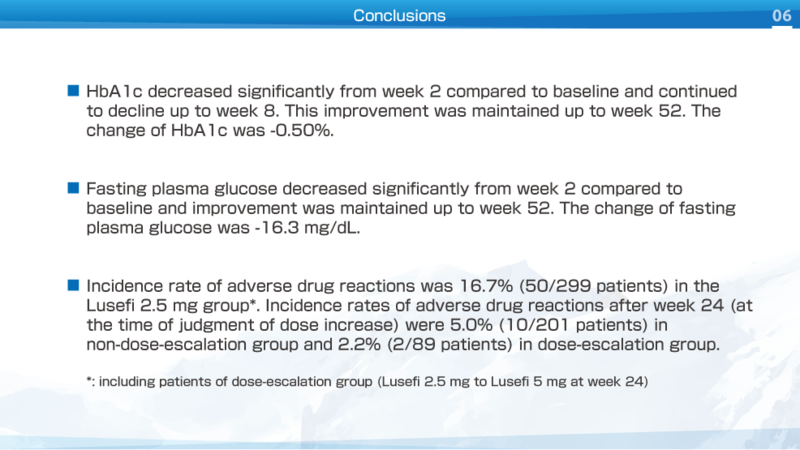 HbA1c decreased significantly from week 2 compared to baseline and continued to decline up to week 8. This improvement was maintained up to week 52. 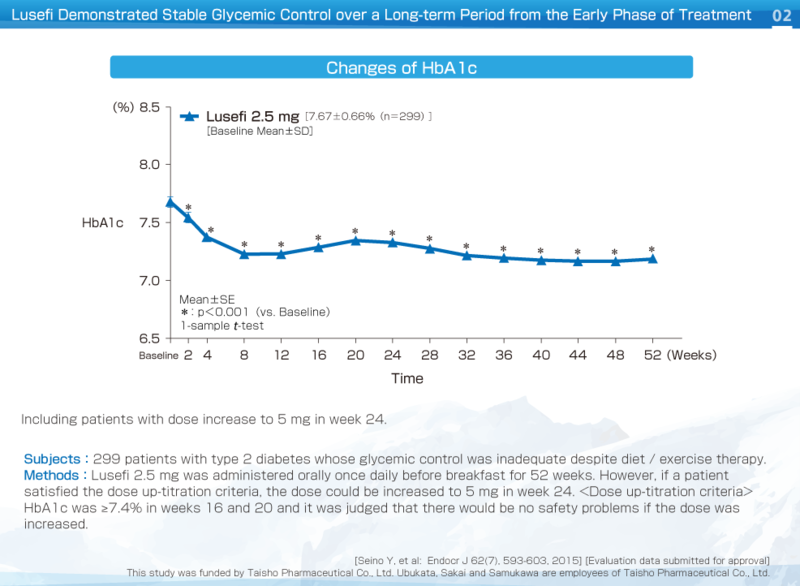 The change of HbA1c was -0.50%. 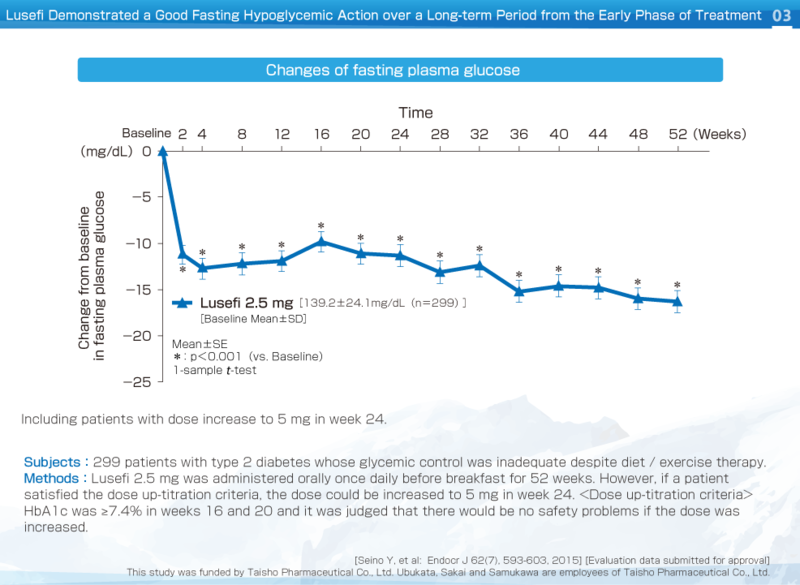 Fasting plasma glucose decreased significantly from week 2 compared to baseline and improvement was maintained up to week 52. The change of fasting plasma glucose was -16.3 mg/dL. 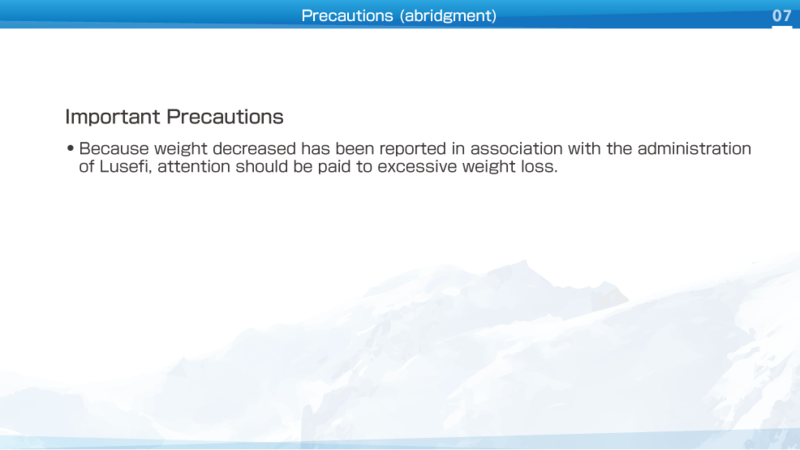 Body weight decreased significantly from week 2 compared to baseline and improvement was maintained up to week 52. The change of body weight was -2.68 kg. HbA1c, fasting plasma glucose and body weight decreased significantly from week 2 compared to baseline and improvement was maintained up to week 52. The change of HbA1c, fasting plasma glucose and body weight were -0.50%, -16.3 mg/dL, and -2.68 kg, respectively.